I’m so proud of coming from a country which has a huge variety of food across the country. Noodle is the most favorite good eat that any tourist has ever come there would give it a try. Phở is a main dish in every Vietnamese breakfast. We’ve never been fed up with this stuff. There are many kinds of Phở. I like beef noodle the most. Phở originates from the North of Vietnam and has been launched to other regions. As it comes to each place, it has an distinctive taste that the chef there adds their favor to modify the origins. Phở in America is served with some various herbs, which is not original way to serve Phở. Phở in Hanoi is considered the best. – In a large 16 quart stockpot, add the beef bone and 10 quart water. Bring it to a boil for 5 minutes and then discard these water to remove the odor of the beef bone. – Add another water to the bone. Bring it to a boil uncovered. Use a mini strainer to remove all the dirty bubbles appearing on the surface of the beef stock. Keep boiling the stock at low heat for 2 hours while continue removing the dirty foam. This step is quite important in that it keeps the stock pure and good smell. – After 2 hour, Wash 1 sweet onion, cinnamon, anise star, cardamom pot and coriander seeds. On the medium heat, grill all these ingredients until they’re aromatic. Add them in a small cotton pocket or any large mesh tea ball and put it into the stock. Boil the stock for extra 30 minutes. 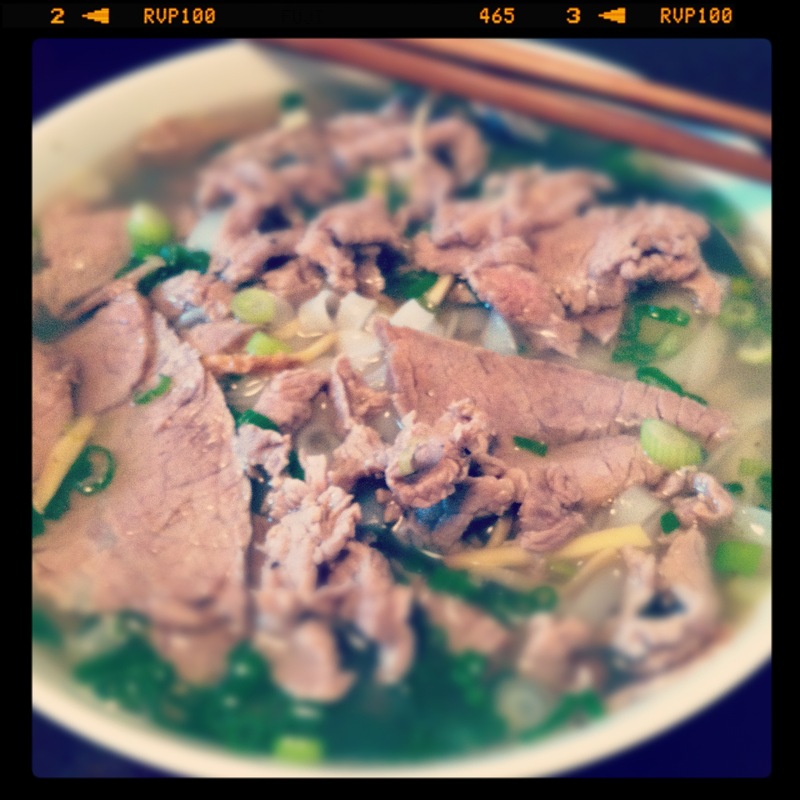 You have an excellent beef stock ready for Phở. – In another sauce pan, boil 1 pound of beef for 20-30 minutes with salt (as salty as your taste) until the beef reach 150F. Set it outside until it’s totally cool down. Slice it into large and thin slices. Try to cut it as much thin as you can. Add the boiling water to the stock. Add salt to your taste. – Cut another 2 pounds of beef as thin as you could do in the previous step. Marinade with ginger strips, salt and pepper for 1 hour before serving. – It’s best if you can find fresh noodle. However, dry noodle still works well. Boil it as the producer’s guidance. – Chop the green onion and cilantro and thinly slice the sweet onion as well. – Place a portion of warm noodle in a bowl. Add boiled beef, sweet onion, chopped green onion and cilantro. Use a large ladle, place the thin sliced beef and add them into the boiling stock until it just rarely cooked. Place them into the bowl and add more stock. – Phở is original served with a wedge of lime, fresh red pepper and crunchy crullers. This entry was posted in noodle, pasta, Vietnamese. Bookmark the permalink.